Derrick Brown in Brisbane came across this and, naturally, with his immense knowledge of typewriters, knew straight away it was something very special. Not alone is the Erika portable typewriter Model 5, from the late 1930s, in almost pristine condition, but more remarkably it is bilingual. Neither Derrick nor I had ever previously seen or heard of a bilingual typewriter. When the capitals shift lock is on, it types in capital letters in English (it has a German language QWERTZ keyboard), and when the lock is released, it types in Cyrillic. No one wanted it when Derrick listed it on eBay a week or so ago, so he has sent it to me in Canberra to be added to the Australian Typewriter Museum. It now sits beside the Erika Model 5 I posted on last week - I wonder which language they might communicate in? The two typewriters, going by the serial numbers, were made within weeks of one another, the bilingual model first. 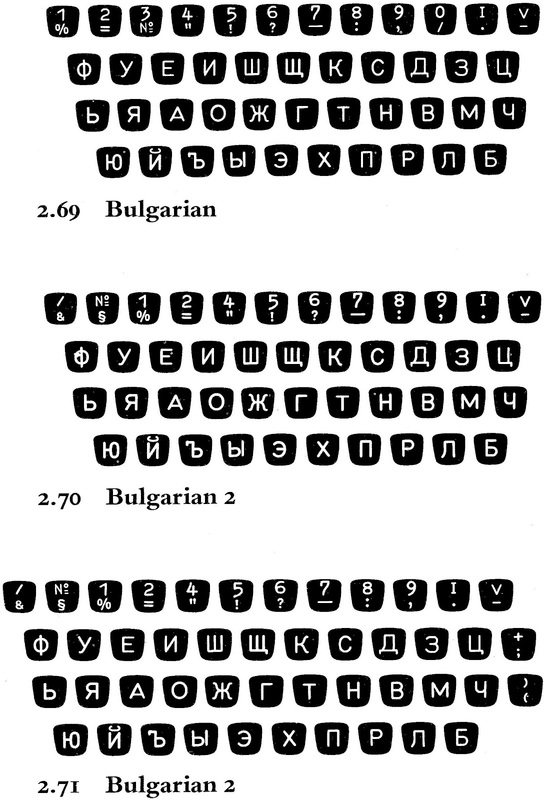 POSTSCRIPT: Following on from his comment, I think Richard Polt is right, it is a Bulgarian keyboard. In Wilf Beeching's book, A Century of the Typewriter, there are three Bulgarian keyboard layouts (shown below), and the one on the Erika, I believe, comes closest to them. What are notably missing are the Э and the Ы on the bottom bank. Wikipedia says Э and Ы are non-Bulgarian Cyrillic symbols. What threw me was that when I tried to translate "bilingual typewriter" on any number of websites, I got lots of lower case "e"s and "a"s, which aren't on the Erika keyboard. Perhaps this is a necessity of a two-language keyboard, with English letters all in capitals. Stunning Erika, and in such beautiful condition! I have seen other bilingual typewriters, but they were in Greek/ English. Thanks Adwoa. Yes, I did see reference to a Greek-English keyboard in my searches after this arrived. That's a very exciting find. Imagine how useful it could be to someone who wrote in both alphabets. Now, makes me wonder if there's a bilingual typewriter with, say, Arabic and Roman alphabets. There would have to be some fancy gearing for the carriage to switch from typing left-to-right to right-to-left. German/Russian bilingual typewriter is quite top of my wanted list. First I tough this typewriter has custom type slugs but I see from the pictures that it might be factory made. Also I see . and , has been place in unusual and somewhat uncomfortable location. That is a fabulous find! Hi Rob. I have a typewriter (Hermes, if I recall right) on which the pull cord goes to the left then turns round a capstan and goes back to the right end of the carriage. Therefore, theoretically, what you are suggesting is possible. I believe sala's point is that the period and comma are in unusual and uncomfortable locations, which is true. This is not a Russian keyboard! It's Cyrillic, but not the Russian layout. I believe it's actually Bulgarian! Hammond made a reversible-carriage machine such as Rob suggests. I have a bilingual Greek/Roman typewriter. You can type upper and lowercase in Greek, but only uppercase in Roman. That is a very beautiful typewriter. I wonder how many biligual typewriters are in existence. I think it would be nice to have English/German (or German/English) or one with Greek and something. Wow - that is an amazing machine! 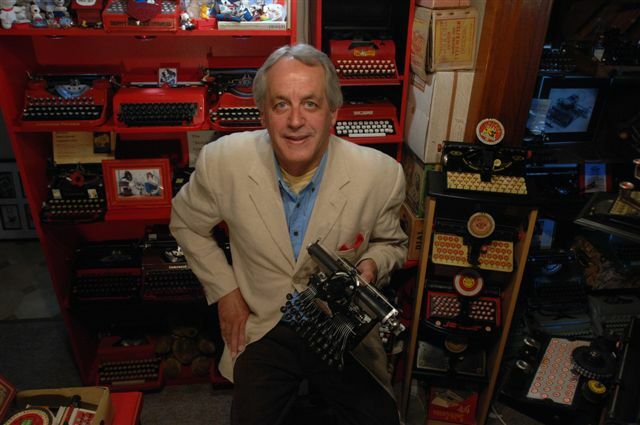 Is Derrick still selling typewriters on ebay? I can't seem to find his page on there at the moment? You seem to have something of further interest here: while the keyboard is certainly Bulgarian, it also contains two old letters: ять/yat [Ѣ] and юсъ большой/big yus [Ѫ]. While both letters had been dropped as part of the 1918 alphabet reforms in Russia, they remained in Bulgarian until as late as 1945. Fascinating typewriter.